Last two league games of this season of IPL 6. Both are important in their own ways, One game will decide who is going to be the wooden spooners and the other to decided the final entrant for the playoff’s. Game 1, Who will be the wooden spooner’s…? Delhi or Pune, both lock horn for the one last time for this season. Finch won the toss and decided to bat first, Uthappa departed early but skipper stayed for bit more long to get himself a fifty in 34 balls. How ever star was Luke wright who gave the electric finish to sedated Pune’s innings with 23 ball 44 runs. Pune finished with their best home score 172/5 in 20 overs. What to write about Delhi’s batting except for one thing, that they definitely played like a team who is going out with a wooden spoon. Dismal and sad effort from a prolific batting composition. Pathan & Gautam played for some time to improve their career runs. In the end Delhi finished at 134/9 in 20 overs. Game 2, Last league game and a very important game as to decide the final team to enter the playoff’s. Sunrisers need to win to enter the playoff’s, if they lose RCB will sneak through for the eliminator match against Rajasthan. Gambhir won the toss and decided to bat first, both Bisla & Gambhir started off very slowly and it continued to be the trend as they never got going even at the latter stages Yusuf pathan once again played a handy knock of 49 runs of 29 balls to get a decent score of 130/7 in 20 overs. Sunrisers on the other hand started off blazing with Parthiv & Dhawan both firing in their ends. A good partnership of 89 runs came to end with a needless reverse sweep from Dhawan. Suddenly panic button was pressed in SRH camp as they lost other 3 wickets on a trot. Sammy’s playing out a maiden of Narine & Perara yorked by Shami Ahmed made even more tensed game for SRH. However T20 wold cup winning captain Darren Sammy made sure the win came from two consecutive sixes of Iqbal Abdulla to make Sunrisers to get into Playoff’s in their very first season. So here is the final four which make the cut for the season 6 of IPL. Chennai will take on Mumbai in the Qualifier 1, followed by Eliminator with Rajasthan Vs Hyderabad. – 600 runs between Uthappa & Finch is the highest by any pair for any wicket for this season of IPL. – 456 runs scored by Aaron finch is the most scored by any Pune Batsman in the IPL history. – 508 runs conceded by Umesh Yadav for this season is the highest ever he has conceded in any season. – 172 runs scored by Pune in their home ground is the highest ever in IPL so far. – KKR’s 100 came off 102 balls, which is the slowest for them in this season. – Gautam Gambhir is now run out in IPL for the 10th time, equalling the table topper Venugopal Rao. – This is first time Gambhir hasn’t scored a boundary in the full power play overs and remained not out till the power play overs. 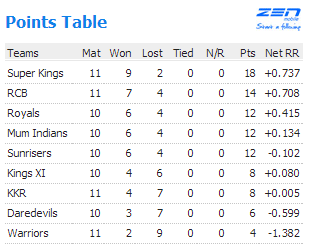 – Sunrisers have won 7 out of 8 games in their home ground, only loss came against CSK. – 89 runs partnership between Parthiv Patel & Dhawan for the first wicket is the highest for any wicket for SRH for this season. – Cameron White picked his 10th catch of this season, making him the fourth in the list of highest catches for this season, list is topped by Bravo with 12. Game 1, Sunrisers take on Mumbai Indians, Mumbai won the toss and decided to bat first, but you should ask why did they…? Dwayne Smith, Rohit, and even Pollard found it difficult to get going, not to leave SRH bowled really well, but not the extent where your strike rate should be less than 100. Few lusty blows by Rayudu made sure they had 129/4 on the board. Chase was never a problem with Dhawan anchoring the innings throughout from ball 1 to ball 108, scoring 73 in 55 balls. He was well supported by Sangakarra and Vihari with 20’s. Fiery spell from Ishant Sharma earned him the Man of Match. 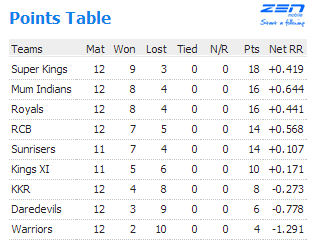 Sunrisers won the match hands down and making the 4th team to join the 12 points list. Game 2, Delhi takes on KKR, another team won the toss and decided to bat first, if you think earlier in the day was a blunder, then you need to come up with a more than that for this KKR’s innings. Disastrous start by losing the skipper without even facing a ball for a Diamond Duck. KKR were 84.6 in 15 overs and going no where. Late strike from bowlers made sure they scored 136/7 in 20 overs. Even though Delhi lost both the openers in quick succession Unmukt Chand & Warner’s 95 runs partnership got Delhi almost close to victory. Delhi also have to thank KKR fielders for putting down catches and fielding pathetically. Delhi won the second game in Raipur back to back fifties from David Warner earned him the Man of the Match. – Shikhar Dhawan scored the 15th IPL fifty and second for this season. – Strike rate of 73.68 by Pollard is his worst in IPL career, when he has scored more than 10 runs. – 100 runs scored in 17 overs by Mumbai Indians is the slowest for this season. – Amit Mishra continues to top the wicket takers list, now he has 90 wickets, followed by Malinga with 89. – Ishant Sharma & Irfan Pathan bowled the 25th & 26th Maidens of this season. – It is 11th time Sachin has been dismissed in the form of bowled in IPL, and it is third for this season. – KKR had 60 dot balls today, which is second highest for this season, PWI has 61 dot bals. – Sumit Narwal scored his career best 23 runs, till today he has scored only 14 runs in IPL. – Gambhir becomes the 5th batsmen to be dismissed for Diamond duck, the other four were Kallis, Gony, Mishra & Rayudu. This is also 14th time Gambhir has been dismissed in the form of Run out. 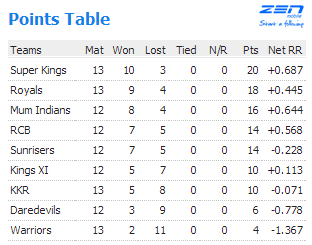 – 37/3 by KKR in the powerplay overs is the least for them in this season. – Unmukt Chand scored the 1200th boundary for this season. – Unmukt Chand’s 37 runs is his best score in IPL career, his previous best was 23 runs. – Both the teams batting first started the innings with a boundary and ended up on the losing side and both the teams chasing won the match by 7 wickets. Fair play Award – Rajasthan Royals. Just a game today, Not much fuss about it though, Both the teams hovering around in the middle and bottom of the table trying to fight their way out of threshold. KXIP started much better for the first time in this season, Gilly looked like he was striking form before he was dismissed. Mandeep, Vohra, Hussey & in the last Gurukreet played their part as well with one last good over by Gurukreet made sure, KXIP finished at 149/ in 20 overs. KKR started off in a shacky fashion as they lost inform Skipper and out of form Yusuf in the very next deliveries n the 2nd over. But its again the old veteran Kallis who stayed along with Bisla to made sure he had a 60 runs partnership to bring the innings in track, later Kallis departed but quick fire Morgan ensure momentum was kept with the required run rate to help KKR safely pass through the winning line. – Sachitra Senanayake bowled the 19th maiden of this season. – This is also the first time Gilchrist has fully played out a Maiden in his IPL career. – 45/0 at the end of powerplay overs by KXIP is the first time they haven’t lost a wicket in powerplay overs but ironically they lost their first wicket on 6.1 overs. – Sarabjit Ladda picked up Miller wicket today, which came after almost 3 years. He played in 2010 IPL and then now he is playing and picking a wicket. – 0/29 by Senanayake is the first wicketless spell by him in this season of IPL. – 8 runs scored by Gambhir is the first score of this season, where he has scored less than 20 runs. – Chawla became the first spinner to concede 2000 IPL runs in his IPL career. He is also the fourth bowler to do so. KKR took on CSK who was looking well set, Gambhir won the coin and decided to Bat first, started off well infact as they brought a surprise element of Yusuf Pathan opening with Gambhir, not a bad ploy as they got to a partnership of 46 runs, before young Hussey halted the process with a stunner in third man. Followed some sign of madness from KKR and sheer brilliance in fielding from CSK to struck a killer blow in KKR to end up with 119/9 in 20 overs. Where they were 46/1 in 5.5 overs, 73 runs from 85 balls later bowled. Just as KKR surprised, CSK surprised with a new opener Ravi Ashwin in front, Innovation is fine, but Batting innovation from CSK mates were not quite enough to pull the game easily from KKR. Not to leave KKR also bowled well and picked important wickets at right time. As always no worries as SIR RJ is in the team, as he finished the game with a well composed innings of 36 from 14 balls. He also with ball picked 3 wickets and had two catches while fielding. Can u just take him out of the game…? Another game, Homecoming for Rajasthan Skipper Dravid still he would liked a win for his team, But Rajasthan were simply outplayed in all department, except for some part where Binny & Dravid played some good innings between them, Royals had nothing to cheer about as they ended just one run lesser than KKR scored in the first game. 118/9 in 20 overs. Easy Chase for a team with the like’s of Gayle,Kohli & ABD, Lost two of those mentioned names cheaply but Man in front lead with a sensible knock to go past the winning line. Vinay Kumar picked 3 important wickets to pick the MOM award. – Ravi Ashwin & Ravi Rampaul bowled the 13th & 14th Maiden of IPL 6, and ironically both are Wicket Maidens. – This is the first time Ashwin has opened a innings in a IPL game, the highest order of batting previously was in the position of No.7. – 11 runs scored by Ashwin equalled his best score in IPL career. – 47 balls between 7.5 to 15.5 overs, CSK had not scored a boundary, highest by any other team in this season of IPL. 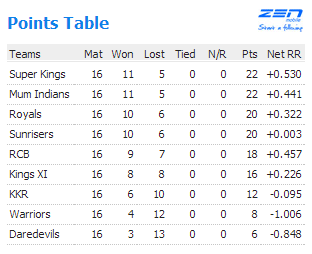 – 70 runs scored by CSK in 15 overs is the lowest score they have made in this season so far. – It is 4th time CSK Skipper Dhoni was Run Out in his 73 games for CSK. 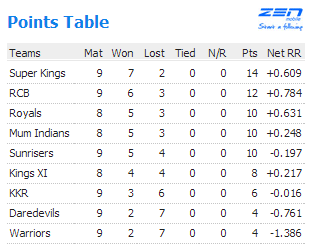 – CSK have never lost a game when they were chasing anything less than 120 runs, and in fact this is 3rd time. – 119 runs by KKR is the lowest for them this season, which just below 125 which they scored against SRH. – This is first time in T20 career Kallis is out for a Diamond Duck (which means out without facing even a single ball, mostly Run outs). 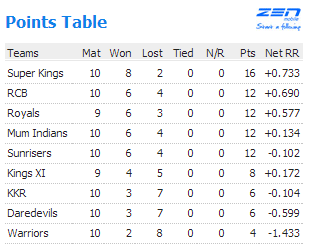 – KKR have never won a game in Kolkata against CSK, now the record stands 5-0. – Ajit Chandila scored his first runs in IPL career. – Both KKR & RR started the match with a boundary of the very first ball of the match, and ironically both ended up scoring less than 120. – Shane Watson bowled his first over in 2013 in any format, and to his joy, he picked Dilshan edging to keeper in the fourth ball of the same over. – This is the first time Gayle has gone past 40 run mark without even hitting a single Six. Its a another double header on a weekday, but never a dull moment in both the games, edge seat thriller made Weekday more brighter esp for Cricket lovers. Gambhir won the coin and decided to field first, KXIP got their best opening partnership 24 runs of this season, before Gilly continued his miserable tour with Bat, Mandeep singh played his part well with Vohra. Later Hussey & Miller struck a good partnership to get KXIP back in track, before Narine came up with an Hat trick to remove the 3 Batsmen in a wisp. That brought Gony into play, who muscled literally every ball he faced to get to the best score of the innings 42 of 18 balls. To end up at 157 in 20 overs. KKR got off to a disastrous start once again as they were 1/2 in 2 overs time. But Gambhir & Morgan pulled a century partnership between them and came as close as possible to win the game, Before Gambhir edged one to Gilly, when they needed 52 from 42 balls. All of a sudden pumped up KXIP started pulling thing their way, and KKR started losing their plot esp the batsmen in the middle both Tiwary & Yusuf threw the game away, as they consumed 14 balls between these space to produce 4 runs. Which proved deadly in the end even though Rajat Bhatia tried couple of lusty blows, it wasn’t quite enough for KKR to cross the line. If u think Wow first game was a big topsy turvy ride, Just look into the second game which unfolded later in the day. It was a big see saw battle out there between RCB & DD, which was finally settled in a super over. Delhi who had a go with Bat first, started well than expected with Shewag & Warner, but once they were out within the space of 4 balls, Later Juneja, Mahela & Rohrer steadied the innings to get a par score, but Pathan & Jadhav ensured Delhi went past 150 runs. RCB who lost both the openers cheaply, again had a rescue act just like game one, but this time from Kohli & De Villers. De Villers was run out unexpectedly when team needed 24 runs of 24 balls, with Skipper playing well who has gone past fifty, How on earth some one could lose this game, Ask RCB as they tied it in the end where they slumped from 129/2 in 16 overs to 152/7 in 20 overs. RCB ended up on the losing side of Super over, but this time they got to bat first and AB does it this as he thumped last two balls of Umesh Yadav to sixes, which ensured Delhi needed 16 runs to win in a super over, Delhi again tried his luck (with some help from Pathan) but in the end fell short of 5 runs. To give RCB the victory which they have got it some 30 mins before all this chaos. – Sunil Narine picked up the first Hat Trick for this season, overall 10th Hat trick in IPL History. – Kallis becomes the first player in IPL to become to score 2000 runs and 50 wickets. – Gautam Gambhir scored his 19th IPL fifty in his IPL career and 3rd consecutive one of this season and 25th of this tournament in the year 2013. – Manvinder Bisla becomes the fifth victim to be out in the very first ball of the innings for this season. – 42 runs scored by Manpreet Gony is his Career best, bettering his previous best 34* when he was CSK. – 23 runs conceded by Sunil Narine in an over is the highest ever he has conceded in any T20 domestic tournament, previous highest ever was 18 runs conceded in the match against RR. – Manpreet Gony becomes the second batsmen after Suresh Raina to score two sixes against Sunil Narine. – 105 runs partnership between Gambhir & Morgan is the third best partnership for this season. – Being involved in a Century partnership, Gambhir now has 3 century partnership with him. – With a wide in the very first ball Balaji conceded 100 extras in his IPL career. Becomes the 14th bowler to achieve this Wack stat. – Mandeep Singh scored the 400th Boundary of IPL 6. – Kedar Jadhav scored the 150th Six of IPL season 6. – Vinay Kumar’s bowling figures for today is 4-0-21-1, this is 4th time in IPL career where he has went lesser than 6.00 economy rate. – Ravi Rampaul bowled the 10th maiden of this season. – Chris Gayle when scored his first runs for the day, he scored 2000 runs in his IPL career & 5000 runs overall in T20 internationals. – Today’s opening pair for RCB Lokesh Rahul & Chris Gayle is the 31st combination for the opening slot, which is highest by any franchise in IPL. – 84 runs scored in first 10 overs by RCB is the highest for them for this season. – There is a funny moment when Speed gun read 173.9 KMPH of a delivery from Morne Morkel, finally everyone realised it is a mistake which should be read 137.9. – Virat Kohli becomes the first player of this season to go past 300 runs. – IPL 6 has the second Super over, and it is the first time in IPL there was a two super over in a season. – RCB involved in both the Super over’s of this year, They lose one against Sunrisers & win one against Delhi.